Hi everyone and welcome to affordablefinds. 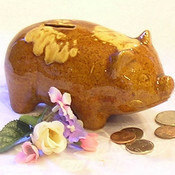 I focus on smaller items that are affordably priced. I still have my dolls, dish sets, trading cards and marbles from my childhood! My other main interest is conservation and animals. I belong to many Conservation/Environment and animal protection groups. I have a cute little mixed breed dog named Lindy that we adopted from a local animal rescue group. She is our only little one at home now that our kids are grown and have left the nest. We have downsized to a smaller home and no longer have room for many of my treasures which I am now selling on my site. I like to ship items quickly and pride myself on carefully packaging your item. I ship primarily USPS Priority Mail but will ship First Class and Media Mail if these are more cost effective. I hope you have an enjoyable experience browsing through affordablefinds please stop by often since I add new items all the time--from things I had packed away for years! affordablefinds doesn't have any items in their booth! pricing is great- her finds are superb and best of all- a nice real time Southerner like us! I have this seller as my fave- why not join in with us?